The openworked Tourbillon movement heights the depth effect created by the gear wheels and the pure mechanics of the movement, already dictated by the absence of a dial. The finely sandblasted surfaces, bevelled and diamond-polished hands, black gold-treated bridges are exactly the kind of finishes that forge the character of MRC timepieces. 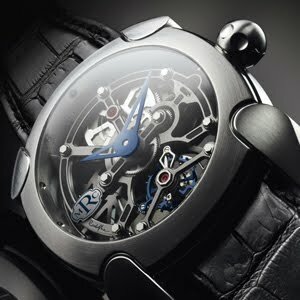 Finally, the Tourbillon placed at 6 o’clock and marking off the seconds dominates the front, while the three-arm “octopus spring” operating the pull-out piece, click and lever governs the movement visible through the caseback.